In stock at Home Depot on 3-22-2018. The purchase price above of this Princeton 10 ft. x 10 ft. Storage Shed by Handy Home Products includes onyx black shingles, roof felt, drip edge and standard OSB floor decking as well as home delivery and professional installation. 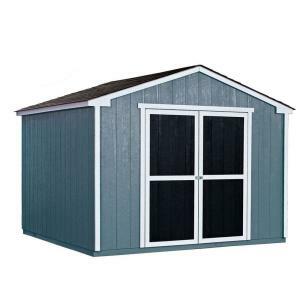 The Handy Home Products Princeton 10 ft. x 10 ft. Wood Storage Shed with professional installation features onyx black shingles and allows you to customize it with paint (not included) to match your home. The 64 in. wide double doors feature full-length hinges and swivel hasps for easy access to large lawn and garden equipment. The sturdy 2 x 3 (Grade) construction helps to meet the demands of inclement weather. The treated wood floor frame is ready for decking, with 5/8 in. OSB included in the installation. Purchase is non-refundable once installation has occurred. Shed must be installed on a flat, level surface (site preparation not included).